Besides Olathe North, no team is playing better than the Falcons. Olathe South has averaged 323 rushing yards in each of their first two games and they're looking like one of the league's elite. After a poor performance in week one the Hawks bounced back with an impressive eight point victory over SM East. Not only did their run game produce (five rushing touchdowns) but they also did a good job slowing the SM East passing attack. The Ravens two wins have come against teams ranked eleventh and twelfth in the Power Rankings, but they've looked good so far, especially on the offensive side of the ball. They rank second in the Sunflower League on offense at 448.5 yards per game. The Lancer's offense played a decent game, despite that fact that they lost their starting quarterback Dakota Collins in the first half. The problem was their defense. 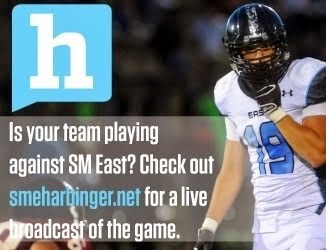 Olathe East ran the ball at will and the Lancers must improve defensively or it will continue to be a major liability. The Lawrence offense looked great--in the first half. Their inability to muster any points in the second half prevented them from putting pressure on Olathe South and potentially pulling out a victory, and they also lost their starting center Brady Murrish in the process. Lawrence's defense also needs work, as they've allowed a touchdown run of 60 or more yards in consecutive weeks. It looked like the Cougars were going to complete a major comeback victory when Jake Horner ran back a SM West fumble 45 yards for a touchdown. But a defensive letdown by the Cougars allowed SM West to score a long touchdown and force overtime, where the Cougars came up short. Russell White, Olathe South: An injury to starting running back Jordan Ward threw White into the mix early and he responded beautifully rushing for three touchdowns and killing the will of the Lawrence defense. It remains to be seen how serious Ward's injury was, but what we do know is that the Falcon's have a another top notch running back in their stable. Dalton Rook, Olathe Northwest: Rook has benefited from not playing against any of the top ranked defenses in the league, but it's hard to argue his success. On Thursday he completed 15 of 39 passes for 315 yards and three touchdowns, and he also added a rushing touchdown in overtime. Rook and the Ravens play SM Northwest next week, a team with a susceptible pass defense, and Rook could be in for another big game. Jake Horner, SM Northwest: Despite his team's 0-2 record, Horner is quickly establishing himself as one of the top playmakers in the Sunflower League. On Friday he totaled 146 return yards including a 95-yard kickoff return for a touchdown in the third quarter which brought his average yards per kickoff return to 54.33. He also returned a fumble 35 yards for a touchdown in the fourth quarter which gave the Cougars a temporary lead. 1. Olathe North (2-0): The Eagles' last road win against SM West was in 2003, but they are a heavy favorite to change that come this Thursday, in a game which will be televised on KC Metro Sports. 2. Olathe South (2-0): The Falcons leapfrog Olathe East and should have no problem pushing their record to 3-0 against Leavenworth. 3. 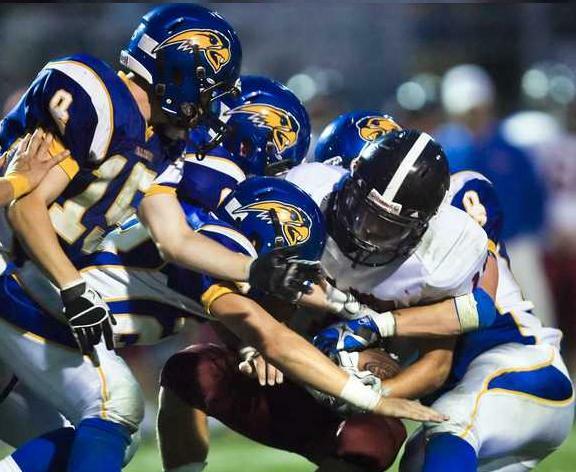 Olathe East (1-1): The Hawks will have played the league's most difficult three-game slate to begin the season following their game against Lawrence this Friday. 4. SM East (1-1): No word is out on the severity of Dakota Collins injury, but backup quarterback Nick Pirotte looked solid in relief effort. The Lancers must also get Elliot Faerber more touches next week. 5. Lawrence (1-1): Quarterback Brad Strauss played okay, but his two interception tosses hurt the Chesty Lions. He's going to need to cut down on his turnovers as the season progresses. 6. SM West (1-1): After a tremendous first half in which they led 24-7, the Vikings more or less faded in the second, and at one point trailed SM Northwest. They must develop some consistency. 7. Olathe Northwest (2-0): With a home game against SM Northwest on tap the Ravens have a decent shot at starting the season 3-0 which would be huge for their confidence. 8. Lawrence Free State (1-1): Free State has a very manageable schedule over the course of the next five weeks but they'll have to mature quickly, because Olathe North and Lawrence complete their schedule in October. 9. SM Northwest (0-2): The Cougar's would love to avoid another 0-3 start to the season but unless they get their defense into gear it's going to be a hard thing to do. 10. SM North (1-1): The Indians 38-point loss to Olathe North in week two was ugly and they will be looking to bounce back against SM East in one of the Shawnee Mission School District's "Nut Cup" games. 11. SM South (0-2): Late game heartbreak has struck twice in as many weeks for the Raiders, but despite the losses the team is looking like a unit that has the potential for some upsets down the line. 12. Leavenworth (0-2): Judson Cole and Jason Randall are the building blocks for this Leavenworth program and they have the speed to eventually sneak up on a team or two this season.